While growing up in a desert community, I had the great fortune of riding horses and motorcycles. That’s how I found out about chiropractic. More accurately, it was the falling off of horses and motorcycles that led me to the chiropractor! A number of high-speed spills resulted in headaches and back pain. My best friend in high school told me about his brother who was a chiropractor. I began getting treatment and those problems that I thought I had to live with went away. I decided then that I wanted to help other people with chiropractic care. I attended the University of Utah in Salt Lake City and received my Doctor of Chiropractic from the University of Pasadena, College of Chiropractic in 1979. During my time in Pasadena, I worked in a large chiropractic clinic that specialized in sports injuries. We treated many professional and world-class Olympic athletes. I opened up my practice in Santa Barbara in 1979. My postgraduate training has emphasized treatment of athletic injuries, several different adjusting techniques, rehabilitative exercise, nutrition and radiology. In 2013, I took the Advanced Clinical Integration course for Selective Functional Movement Assessment. This work developed by Gray Cook, MSPT looks at not only how we move, but how to find and correct abnormal movement patterns that are often the underlying sources of chronic pain. This assessment helps me to better know how to treat you. Then, in 2014, I took the Foundation Training Instructor certification course. This self care-based exercise approach developed by Eric Goodman, D.C. has been a remarkable tool for our patients. When combining chiropractic care, movement pattern assessment and the right exercise, we’re seeing some amazing results in our patients. On a personal note, I am very happily married, and we have four grown boys. Outside the office, I love to surf! Spending time in the ocean and riding my longboard is the most relaxing and rejuvenating sport that I have ever done. This is especially true when it’s with my family. I also enjoy working as a mentor with men at the Santa Barbara Rescue Mission and leading worship at a men’s group called Believer’s Edge. I have been very fortunate to enjoy good health. Just like my patients, I must exercise regularly to keep up with what I love to do. The more regular I am about exercise, the better my chiropractic adjustments hold. I practice Foundation Training exercises every day. 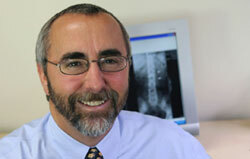 How can we help you with today’s safe and natural chiropractic care? Contact us today so that we can help you take your first step toward better health.